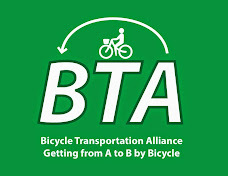 Perspectives on getting from A to B on a bicycle in Daytona Beach, Florida. I have two xtracycles at home so I had to participate in the Cargo Bike Roll Call ride even if all I brought was my folding Bike Friday bike. Saw at least three Bike Friday Haul-a-Days on the ride. 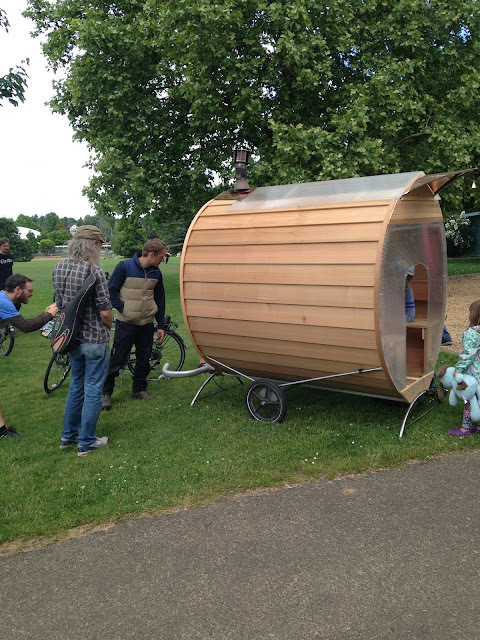 A bicycle-pulled sauna. Why not? Great to see all the kids on the ride. 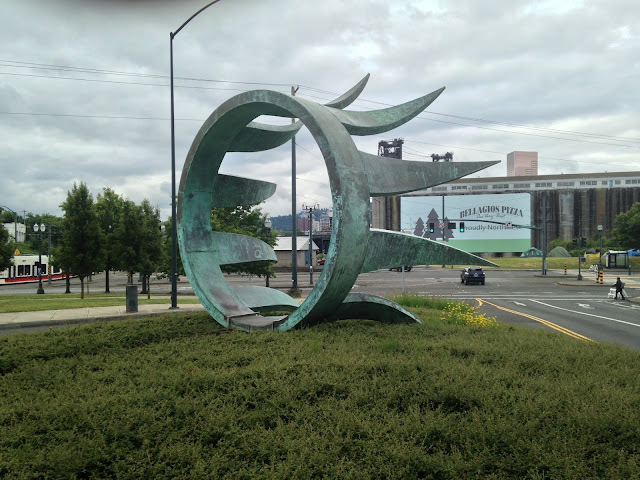 Portland's greenways are so nice! Another Haul-a-Day with extra wheels for walls. I like these bicycle-only left turns. These diverters reduce car traffic on greenways. Twenty is Plenty! 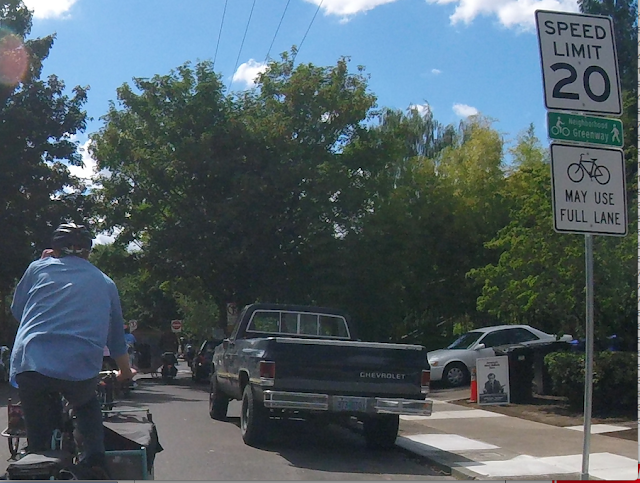 Portland's Neighborhood Greenways are 20mph and have low car traffic volume. We rode round Ladd's Circle only 4 times, 496 to go! Note the cartoon doggie doing a handstand on the Sharrow. This guy wins for heaviest load! 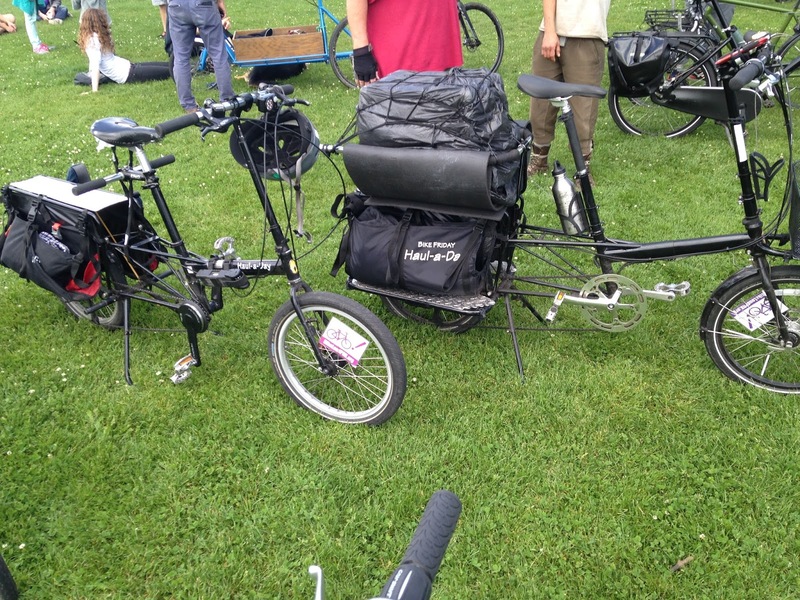 Long-tail cargo bike plus a trailer. 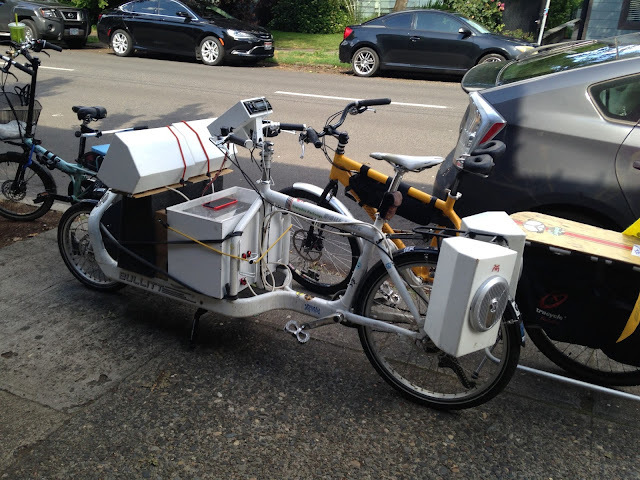 Quite the sound system on this cargo bike. 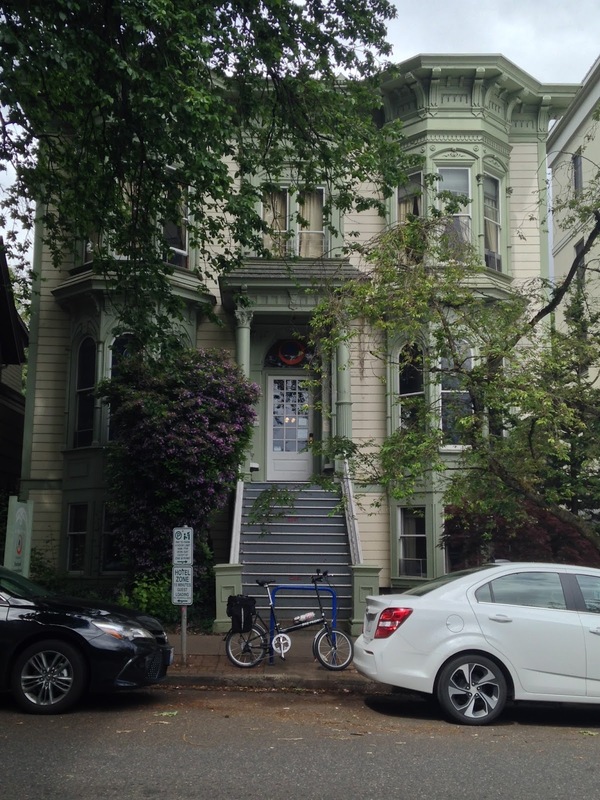 I toured the city early Sunday morning, June 11th, taking a route suggested by Where to Bike. 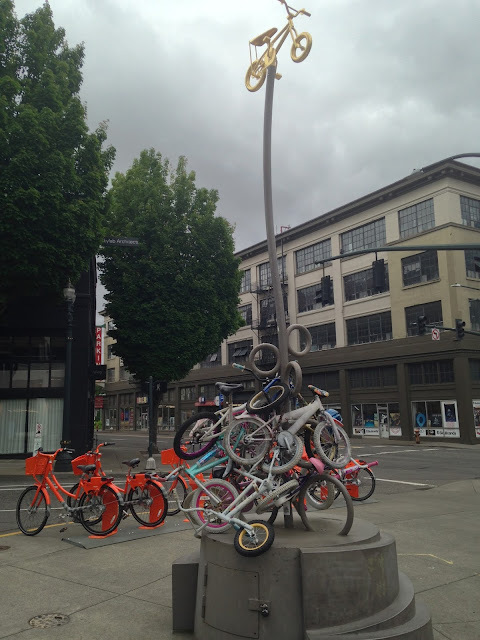 Bike sculpture and Zoobomb bike storage. My Bike Friday in front of the guest at at the Northwest Portland Hostel on NW 18th Ave. Check it out! 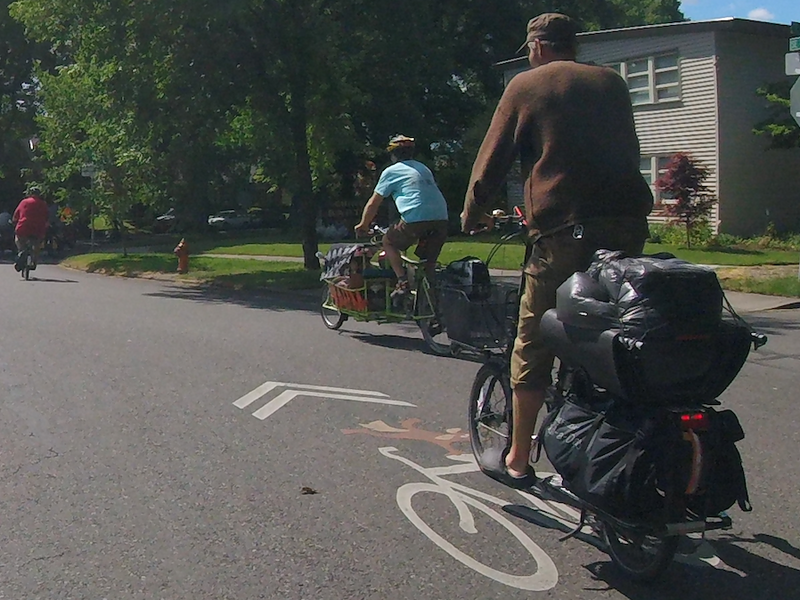 Two side-by-side same direction bicycle lanes. was removed from this street sometime after 2016. 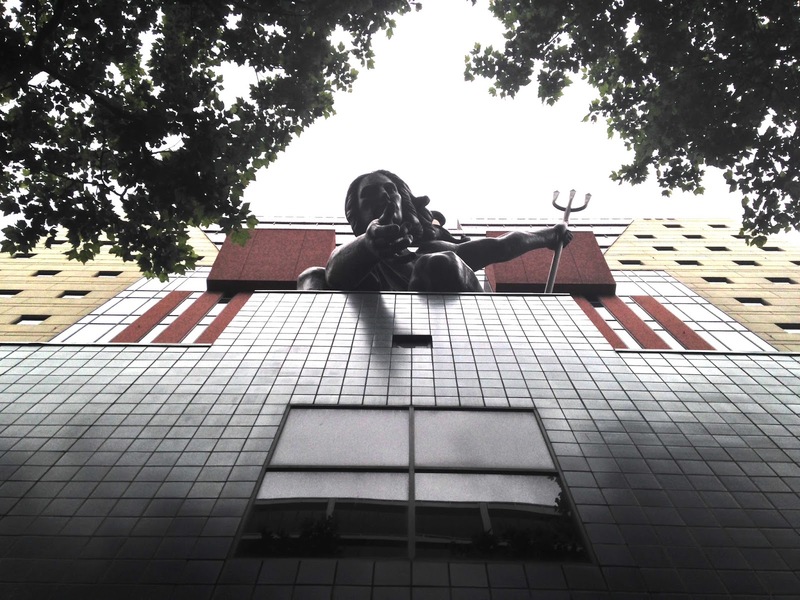 On the Hawthorne Bridge. I like the clear bike and pedestrian markings. My first ride in a left-side bike lane. Unusual being in the passenger side door zone. 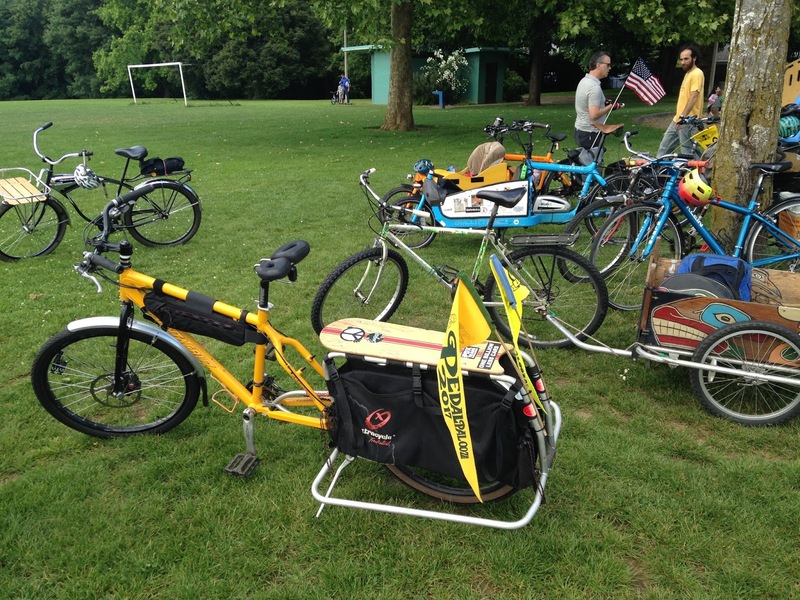 Bikes and transit, great combination. Riding the nice recent bicycle infrastructure on Natio Parkway. Lots of green for people on bikes near the transit station. Only bicycles and buses can go straight here. Striking how many big arterial roads have speed limits 45 mph and greater and no shoulders. Few bike lanes and paved shoulders on slower roads. The street grid is often interrupted and this forces people who bicycles on to these bigger roads. Less stressful north-south connections east of Ridgewood Ave/US-1 and between Hand Ave to the north and Beville Rd/SR 400 to the south can use the network of smaller, low traffic-volume city streets. North of Hand Ave many cul-de-sacs provide little to no connectivity and people on bicycles must brave busy roads and take lengthy detours. On the Beachside, connectively south of Mason Ave/SR 430 is absent apart from Peninsula Dr and A1A, both of which lack shoulders. All or parts of several wide east-west, 35-mph roads like Mason Ave and Dunn/George W Engram Blvd, lack shoulders or bike lanes. There appears to be errors in the paved shoulder database. For example, paved shoulders are indicated on Beach St between Orange Ave and Bay St in Daytona Beach. Instead there are four lanes with a median and no shoulders. Daytona Beach in currently working on a Bike/Ped master plan. I hope they take this lack connectivity into serious consideration.